This is our assignment for the Aspire and Inspire sparkteam: February 20th is Love Your Pet Day. Love Your Pet Day is a day to pamper your pet. People just love their pet, and today is an easy excuse to spend time with them, and to give them special treats. 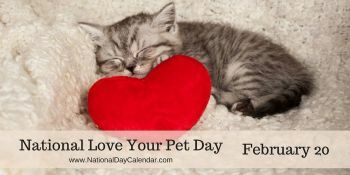 Whether it’s a dog, a cat, a fish, a pet snake, or your pet rock…give them lots of love and attention today. If you have a pet, do you intend to do something special for them, spoil them even more, etc. on this day? Tell about them and what they mean to you. Beautiful cat and loyal companion. It's nice that Simon takes good care of you, especially when you don't feel well. Simon looks like a great companion. Simon is a sweetheart! Pets sure do sense when we need some extra love and attention. I’m glad Simon was there for you when you were sick. Awwwww, Simon is handsome! I miss my fur baby Mr. Spot the Wonder Dog. I know eventually 'll get another pup, but just not ready right now. Simon looks like a sweet kitty! It sounds like Simon is a very good companion and loves you too. Glad you gave Simon some extra attention and love on Love Your Pet Day! Our pets love us unconditionally. My day would be empty without my two cats. Your Simon sounds very special.